When people think of pear shaped women, sometimes all they imagine is someone on the chubby side. Whatever weight or height you are, you can be pear shaped. For the past few months, I felt like I was in a fashion rut. Because of my pear shaped body, I felt like there were only a few silhouettes I could pull of and I wanted variety. Low waist shorts + tops, dresses and high waist skirts have been my uniform and I needed new pegs. I turn to google and look for pear shaped fashion bloggers. 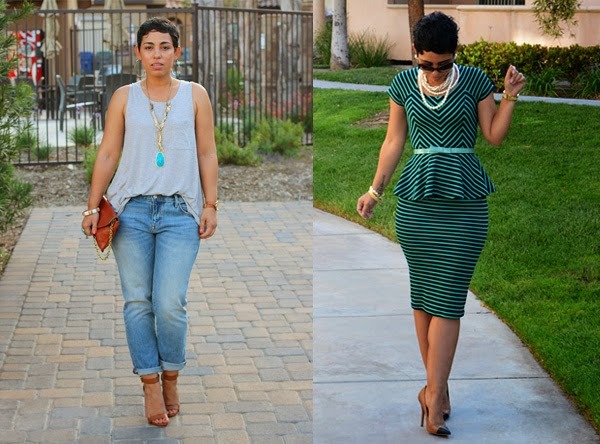 I bookmarked 2 bloggers whom I love: Delmy of Fashion Bananas and Mimi of Mimi G Style. They gave me fresh ideas to play with and have become a good source of inspiration. I am on a no-shopping-for-realzzz-ban so I haven’t added items to my wardrobe but because of these 2 bloggers, I have ideas on standby. Here are photos of Delmy and Mimi that show off their curviness, they are pears like moi. For this post, I’m sharing outfit ideas where Delmy and Mimi broke the rules. This just shows if executed correctly, you can bend the rules and try them as well. I think all the images of the 2 women look fabulous while breaking fashion rules for pears. I was pleasantly surprised when I saw this photo, she looked great and the skirt didn’t emphasize her hips. I think the whole outfit balanced itself out giving her proper proportions. Delmy breaks this rule and at the same time obeying one: belting it. I am a fan of color. 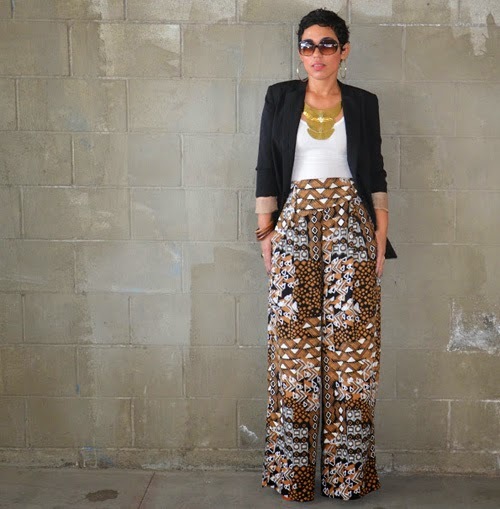 It kills me not to wear printed pants that come in the softest fabrics. Delmy wears this one attractively. I love the color combination! She’s even wearing skinny pants which aren’t the number 1 best silhouette for pears (it’s the boot cut or wide bottom ones). Notice the jacket and necklace? Those two elements help draw attention up balancing the printed bottom. The jacket is the perfect length for pears giving a softer silhouette in the hip area. In the second photo, she may not have a jacket on but the necklace is still there. This photo also breaks the light top + dark bottom rule. Like the jacket, the shirt is a good length on Delmy. It’s another example but this time in a different style. This outfit works because Mimi is rocking a fit that is flattering to all pears – wide legged pants. It also helps that the print isn’t loud and the white shirt and necklace draws attention up again. The outfit looks so comfy and chic at the same time! It’s something you can easily wear to work. Not only is Mimi wearing horizontal stripes, it’s a figure hugging dress as well. I’m used to minimizing my curves, she inspires me to embrace my curves and flaunt them. I hope a find a dress or outfit that flatters like this one. I am excited to try these ideas and add to my closet – when the shopping ban has been lifted. Haha I highly suggest getting familiar with your body type because it will help you love yourself more, save time and money. I have. You can ask my fashion projects Danix, Owee and my sister Rissa how knowing their body type and the rules have helped them. Do you know of other pear shaped bloggers? Let me know please! * All photos from Delmy and Mimi.